Starting as a graduation project in January 2008, KNARR™ project nearly stopped before it started. Our professors at Aarhus Architecture School thought it unrealistic, science-fiction like”. After graduating with honours, we received great praise from international media and the KNARR™ project was exhibited in Japan, presented at TEDx, awarded both Danish Design Center’s Special Prize and the international Core77 Design 'Speculative Concept' award – on top of getting us employed at the world’s leader in wind energy Vestas. Our goal has been to make a freight solution, which will reduce the energy consumption of today’s wind turbine freight. Furthermore we wanted to make the logistics around the wind turbine freight more simple and efficient. 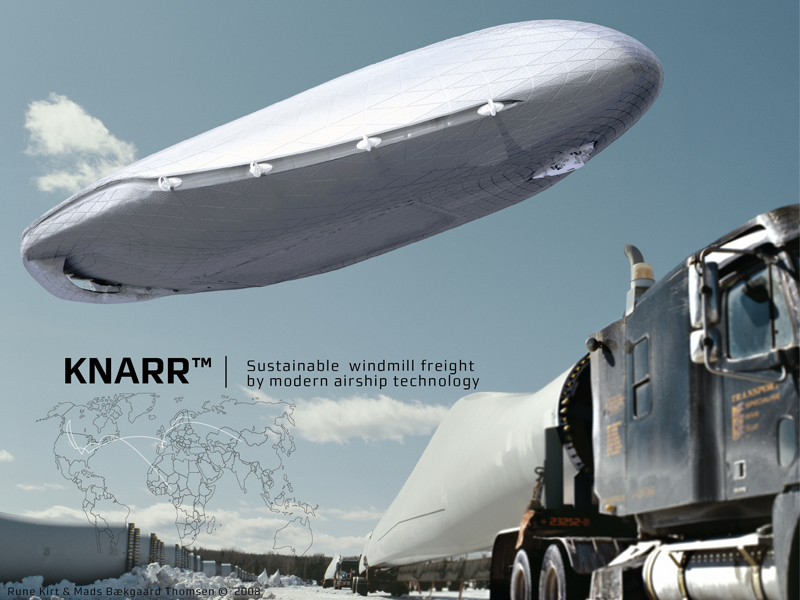 We have made a solution for an airship, which will be capable of transporting the wind turbine parts from manufacture to installation site. In order to address all of the aspects of the concept, we worked with different visualization methods. "This design proposal was highly visionary, spoke to a very real issue, and demonstrated brilliant execution. Even though the notion of a dirigible is not new, the application and adaption of the concept for the delivery of oversized components for large-scale wind energy generation places it in the category of a new paradigm. If this project were to get support, and become viable, it would be instrumental in bringing about a large transformation in wind energy production."